In Madeleine's memories, her grandmother Margie is the kind of woman she should have been—elegant, reserved, perfect. But when Madeleine finds a diary detailing Margie's bold, romantic trip to Jazz Age Paris, she meets the grandmother she never knew: a dreamer who defied her strict, staid family and spent an exhilarating summer writing in cafés, living on her own, and falling for a charismatic artist. Despite her unhappiness, when Madeleine's marriage is threatened, she panics, escaping to her hometown and staying with her critical, disapproving mother. 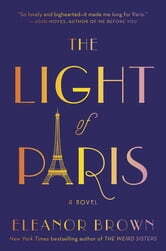 In that unlikely place, shaken by the revelation of a long-hidden family secret and inspired by her grandmother's bravery, Madeleine creates her own Parisian summer—reconnecting to her love of painting, cultivating a vibrant circle of creative friends, and finding a kindred spirit in a down-to-earth chef who reminds her to feed both her body and her heart. Margie and Madeleine's stories intertwine to explore the joys and risks of living life on our own terms, of defying the rules that hold us back from our dreams, and of becoming the people we are meant to be. Madeleine Bowers Spencer isn't happy with her life or marriage. She's unsure of what she wants in life, but she knows it isn't this. The only thing she can think of is to return to her familial home and reassess life in The Light of Paris by Eleanor Brown. Madeleine has always felt that she was a disappointment to her mother. She didn't want to be a society lady. She wanted to be an artist. Painting was an acceptable hobby but not a career goal according to her parents. So she put away her paints and tried her best to fit in. She even married an acceptable man just to make her mother happy. It is only after returning home while taking a "break" from her marriage that Madeleine discovers that she may not be anything like her mother, but she has a lot in common with her maternal grandmother, Margie. Reading through her grandmother's journals, Madeleine finds that her grandmother often felt as if she didn't fit in with polite society either, but all that changes when she gets to spend a wonderful summer in Paris. Margie gradually breaks out of her shell and lives the life she always wanted, even if it was only for summer. Can Madeleine truly follow in her grandmother's footsteps and do the same? 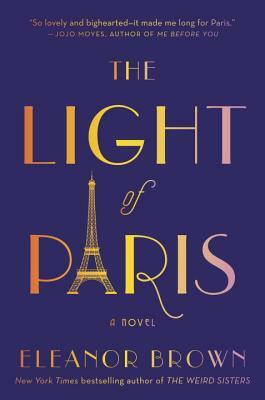 The Light of Paris was a delightfully endearing and fast-paced read. The story is told in alternating voices of Madeleine in 1999 and Margie in 1924. I enjoyed the parallel stories of two women that tried their best to be something they weren't just to please their families. Both Margie and Madeleine had dreams of who they wanted to be and both seemed to let those dreams die, Margie due to societal restrictions and Madeleine due to perceived restrictions. The Light of Paris is a story about self-discovery and awakening as much as it is about family, life, and love. If you enjoy reading stories about life, hope, and second chances, then you'll definitely want to read The Light of Paris, and I hope you'll enjoy it as much as I did. Disclaimer: I received an uncorrected proof/review copy of this book from the publisher. I was not paid, required, or otherwise obligated to write a positive review. The opinions I have expressed are my own. I am disclosing this in accordance with the Federal Trade Commission's 16 CFR, Part 255: "Guides Concerning the Use of Endorsements and Testimonials in Advertising."